First raised beds ready for broadbeans and garlic for overwinter? This is really looking good. Are the raised beds level, or have you gone with the slope of the lawn ? Cheers. 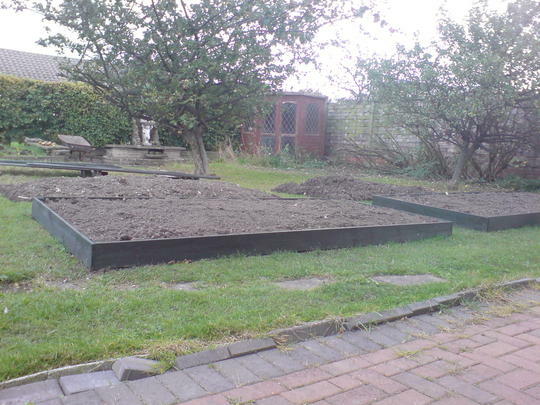 Maybe the photo doesn't give the correct impression but both the beds and the plot are pretty level. Yes, the picture is deceptive. Looks great AN. Will you be able to grow beans over the winter?? Hope so Gilli. They are all through so will need to provide them with some protection so I get an early crop in spring. What will you use for protection AN? Do you just mulch or do you cover them? I am trying a mulch from the compost heap. Some varieties can be grown over winter including this particular broad bean named 'Aguadulce'.They do need protection and I am hoping that I have covered them in time as we have had a couple of nights of severe frost. I'll keep my fingers crossed for you AN. You'll have to post some pics of how they are doing. Will do Gilli. I notice from your notes that you are a bit of a rose expert. I am looking for a climbing rose as the centre piece for a circular raised bed in the middle of my lawned front garden. Preferably a prolific flowering red variety but am open to other suggestions on colour if a particular variety stands out ahead of others in terms of length of season and amount of flowers. Anyone else got any recommendations? There is a short climber called Quadra which is part of the Canadian Explorer series. Very cold hardy - zone 3 with no winter protection. It is only 5 to 6 feet but has a climber type growth. "True, rich, deep dark red flowers bloom repeatedly throughout the season though most abundantly in early summer. These stunning flowers are large, doubled and are borne alone or in clusters of up to four. Its spreading growth habit can be trained to climb. Resistant to powdery mildew and blackspot". It is rated quite well especially for northern winters. However, I don't think you would need one this hardy for where you are. My "reddish" climber is called Night Owl. I haven't had it that long so I don't think it is mature yet. However, it has performed beautifully so far. Night Owl is more of a purpleish colour in cooler weather but changes to more of a magenta in the heat. Hope all of this is of some help. Hopefully some of the UK members will be able to suggest roses which would do well in your area. Thanks Gilli. I have checked your suggested sites and on the David Austin page there is a climber called Tess of the d'Urbervilles which looks like a really good prospect. I will visit our local rose grower to see what is available including the others on your list and let you know. I think I will stick to the 'Tess' option as the David Austin blooms look impressive. My local specialist rose nursery has a number of David Austin varieties but not Tess unfortunately. However I can order on line direct from DA nurseries in Wolverhampton if I can't find it locally first.